Groundwork Lawrence Spring 2012 Happenings! Urban Adventures Summer Day Camp Registration Open! Spring is in the air! We are ramping up here at Groundwork Lawrence with many exciting projects just in time for the warm weather. 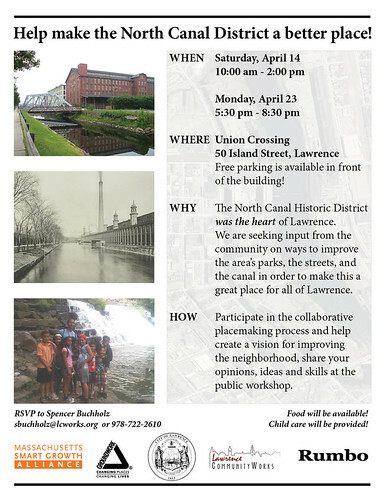 Join us on Saturday, April 14 for the collaborative North Canal District Place-making workshop to help create a vision for improving this growing neighborhood. Of course, we are also getting ready for our huge event, Earth Day, Comcast Cares Day which will bring approximately 1,000 volunteers to the North Common and other locations around Lawrence for clean-up and beautification projects -- and we would love for you to join us! We are also expanding our inspired Green Team program as well as actively looking for Team Leaders. Urban Adventures Day Camp, offered in partnership with Mass Audubon, is now open for registration and we are once again partnering with Farmer Dave to make local, healthy food more accessible through our Groundwork Lawrence Share-a-Share program. There is so much to get involved with at Groundwork Lawrence - and this time of year is a fun time to do so. We hope you'll join us! a Better Place to Live, Work and Play - April 14 and 23! Great Neighborhood Initiative, the Project for Public Spaces (PPS), will be joining us to facilitate the workshops. PPS is a non-profit planning, design and educational organization based out of New York City, which is dedicated to helping people create and sustain public spaces that build stronger communities. PPS has completed over 2,500 projects in over 40 countries and all 50 US states. Want to know more about PPS? Click here. To learn about some past and current projects that PPS is participating in, click here. Thank you to the MA Smart Growth Alliance and their Great Neighborhoods Initiative for providing this great resource to the city! Check recent coverage of the event. Join us for Earth Day, Comcast Cares Day - Saturday April 21! With generous support from the New Balance Foundation and the MA Department of Conservation and Recreation through a subgrant from the Boston Youth Environmental Network, we are launching our second cohort of Green Team youth this summer, hiring Team Leaders and extending Green Team hours! "It's really hard to explain what Green Team is... We are a group of hardworking teenagers who genuinely care about the city we live in, and want to work toward changes that will benefit every resident. It's easy to list the physical things we do: hiking trips, farming, gardening, and organizing park cleanups, just to name a few. However, it's the vision of a greener Lawrence that really defines us as a team." 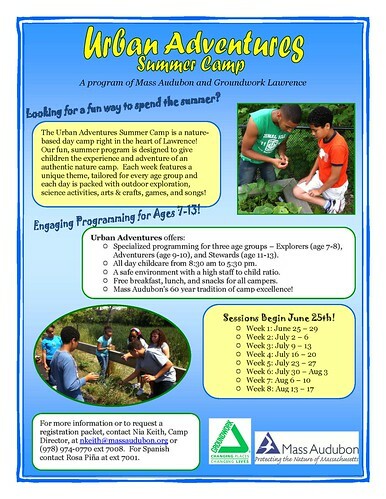 The Urban Adventurers Summer Camp is a nature-based day camp right in the heart of Lawrence. Our fun summer program is designed to give children the experience and adventure of an authentic nature camp. Each week features a unique theme, tailored for every age group and each day is packed with outdoor exploration, science activities arts &crafts, games and songs. We strive to make high-quality fresh produce accessible to as many members of our community as we can. 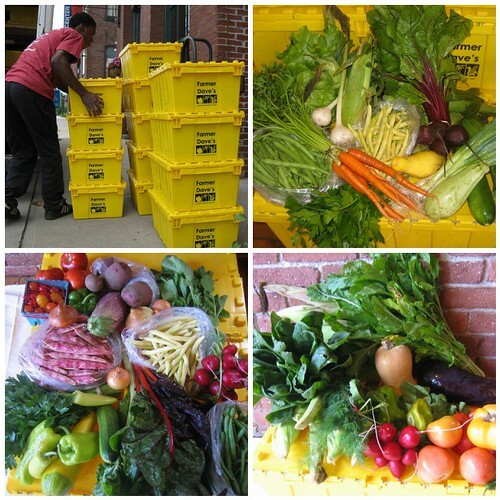 In 2008 Groundwork Lawrence established a fund to subsidize the cost of CSA shares to individuals and families experiencing financial hardship. This year Groundwork Share-a-Share™ donations will be used to ease the cost of fresh food through subsidized CSA shares, gift cards and incentive programs for our Farmers Markets, and fresh food donations to food pantries. Through our Groundwork Share-a-Share™ Program, you can make a tax-deductible donation to help us extend the benefits of fresh, locally-grown food to those who would otherwise not be able to afford it. Thanks to the generosity of 2011 CSA members, Project Bread, and the greater Groundwork community, we were able to raise over $10,000 for the Share-a-Share™ program. This year, as we extend the reach of our Share-a-Share™ program to include the Farmers Market and other fresh food donations, our goal is to raise $15,000. Can you help us get there? Donate. On April 10, 2012 Heather McMann was presented with a Special Recognition Award on behalf of Groundwork Lawrence by the Essex National Heritage Commission. The award was in recognition of outstanding commitment and dedication to improving the quality of life for Lawrence residents through open space preservation, strategic planning and community education and involvement. Executive Director, Annie C. Harris of Essex Heritage along with their President, Rich Yagjian are pictured below presenting Heather (far right) with the award. Thanks for learning more about our work! We look forward to connecting with you on our programs and impact in the community at season's end.